Ugh!!!!!!! I am so sick of seeing this posted on different paranormal-themed Facebook pages/groups. 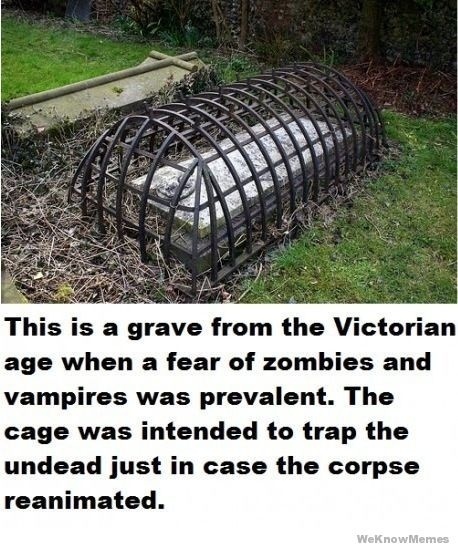 I'm even more concerned when I see scores of people who actually BELIEVE that this metal cage is actually intended to trap a reanimated corpse. Our Victorian ancestors were not stupid. What they were afraid of was much more terrifying than zombies and vampires. These metal cages were not intended to keep the ghouls from getting OUT....they were intended to keep the monsters from getting IN. Before that time, medical students could only dissect and otherwise use cadavers 'donated' by criminals who had been sentenced to death. And, just about any offense could lead to hanging, lol. However, during the mid to late 1800s, social justice reform was leading to less offenses being punishable by death, and thus creating a huge shortage of corpses available to medical students. Medical science was making great strides throughout this time period, so a good supply of fresh corpses was EXTREMELY important. To help meet the demand, 'ressurectionists' would steal the bodies of the newly buried and then sell them to medical schools, generally with no questions asked. As the practice became more and more of a threat, mortsafes and other devices were invented as a way to safeguard the bodies against theft.